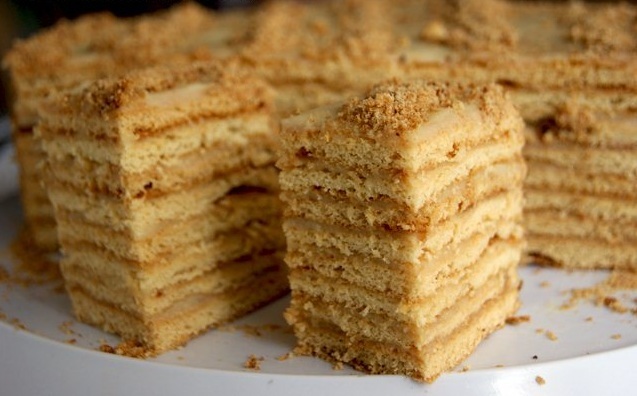 How to cook cake "Ladies fantasy"? How to cook salad "Prince"
There are many ways of cooking this dessert, and most of them are quite time consuming. This recipe, in contrast, is very simple and includes products that will are in your fridge. - 25 g of cocoa powder. Grated chocolate and ground nuts for decoration. First make the cream. Pour milk into a small saucepan, put on fire, bring to a boil. Divide the eggs into whites and yolks and the last mash it thoroughly with the sugar, vanilla sugar, 2 tbsp flour and cocoa powder. Without ceasing to interfere, pour in the hot milk. Thoroughly mix and return to the stove, diminish the heat to low and cook until thick, continuing to stir. Remove from heat, let cool slightly. Beat, adding the softened butter in a magnificent mass. For making cakes with a mixer, beat the eggs with vanilla sugar. Add the softened butter and honey. The mixture should be homogeneous. Add cocoa powder, mix again until smooth. Sift into the mixture the flour and knead not abrupt dough. Divide the dough into 6 pieces. Roll out each form. You can cut the cakes using a large meals. All pruning is to maintain and bake with the cakes in a preheated 180 degree oven for about 10 minutes until tender. Cool cakes and coat with cream. The top and sides, decorate with chopped scraps of dough, ground nuts, grated chocolate. Leave to soak first hour at room temperature, and then the night in the cold.